Adult Volunteers, we'd like your feedback on the enrollment process and new training from eXtension! The 4-H Youth Development Program is a non profit youth educational program administered through the UC Cooperative Extension. 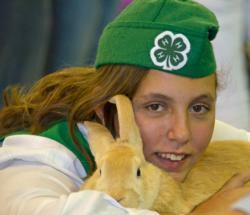 In 4-H, kids learn, have FUN, and run the show! 4-H is an international organization for youth that promotes hands-on learning, for ages 5-19, from all ethnic, racial, and socio-economic backgrounds who live in rural, suburban, and urban communities. The four H's in 4-H stand for Head, Heart, Hands, and Health. The 4-H program provides youth with a variety of learning experiences that contribute to their personal growth and development. The program helps them to become self-reliant, responsible, and productive members of society. Age appropriate projects within each club are the heart of 4-H's hands-on learning. Each project focuses on a topic - anything from art to zoology - including: animal sciences, bicycling, camping, computers, drama, entomology, leadership, music, photography, quilting, rocketry, textile arts, and woodworking to name a few. These opportunities are designed to be fun while teaching real life skills. Projects are lead by older youth and/or adult volunteers. Programming varies from county to county, year to year. There are special policies regarding participation, competition, and animal projects for primary members.